Chance to Win Little Leticia!! Time for some fun!! As a valentines day special, I am giving away a small version, finished teddy bear, to one lucky customer who buys a Leticia pattern. The little bear is a mini version of Leticia. I made her from viscose German fabric and she is stuffed with bamboo eco filling. She has a nice vintage look. She comes with her pretty lace shawl and signed and dated swing tag. I launched this new pattern recently and all customers buying the Leticia pattern are eligible. You can purchase the PDF pattern for Leticia from my Etsy shop. 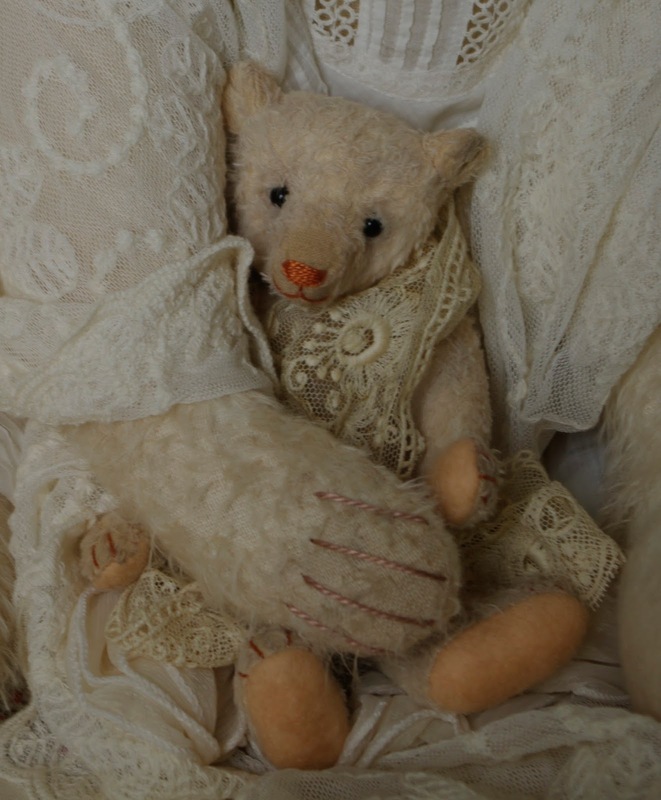 The pattern makes a 21 1/2" tall, fully jointed bear and my choice of materials is a medium length , sparse mohair. I go into some detail on the aging process I use and there are helpful pictures in the 9 pages of instructions plus the pattern. The pattern is for the bear only. I have dressed Leticia in an antique baby dress and lace shawl for you to see how pretty she can look. E-Pattern is presented in PDF format and contains instructions, pattern, material list necessary for making a bear and aging technique.Patterns are for personal use only and not to be reproduced for commercial purposes.Upon payment the files for the pattern will be immediately available to you to print on A4 size paper which is 11 1/2" x 8 1/4" or if in the US you can print on legal paper which is 8 1/2" x 14" . Here is the link for my Etsy shop where you can purchase the pattern. This chance to win the 8 1/2"bear finishes on the 12th February. You will be entered into a lucky draw to be announced here and on Facebook on the 14th February. Thank you and good luck!! Link for Hampton Bears Facebook.